If you are like almost everyone, vacations and traveling are something that you get excited to experience for months leading into the trip. There is planning, buying the tickets and studying the new place you are going. All this excitement and anxious energy builds up into a crescendo so that when the trip finally arrives, you can hardly believe it’s actually happening. No one ever remembers when things went perfectly. Afterwards, you return home and in an effort to give yourself something to remember this amazing experience you come home with souvenirs. We all have them, some sort of junky chotsky that you picked up at the store or airport on one of your trips. 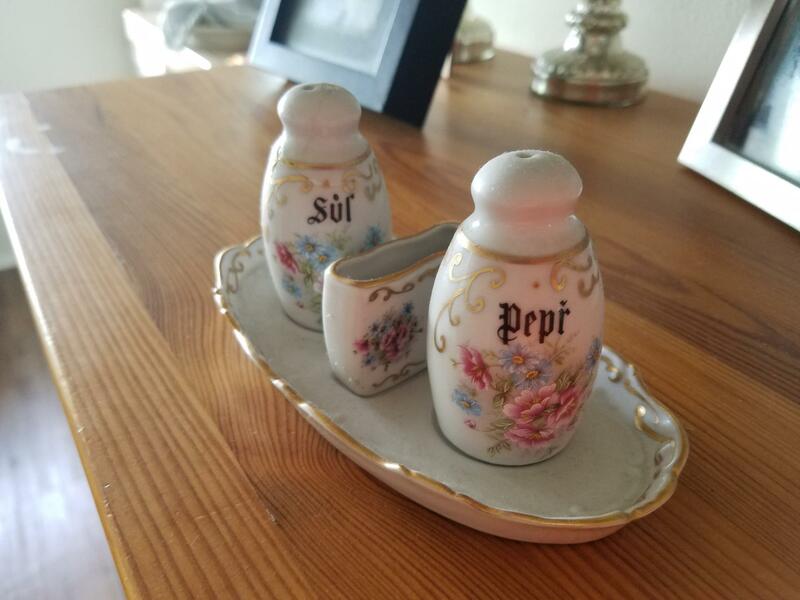 In fact, Mrs. Wow collected shot glasses from ever where she went. People would even bring her glasses from places that she has never been, which seems odd to me. 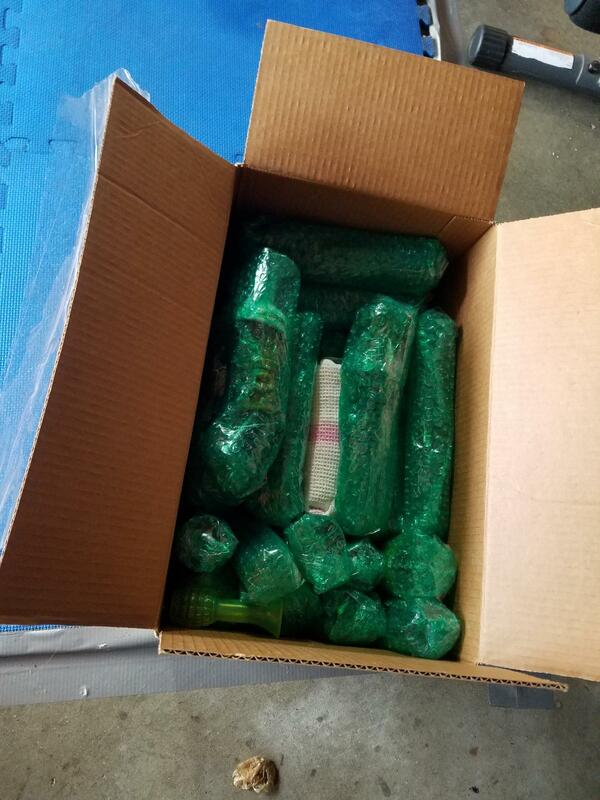 Shot glasses still wrapped up from our last move. But, as we’ve begun to purge our stuff, and start clearing things out we’ve started to find more and more of these things, especially with our current purge one thing a day initiative. As we’ve begun to travel more, we can’t just keep collecting junk, it would over run the house. We also like to pick up a print from where we have been. These are the only pictures we have hanging in our house at the moment. Every picture has a meaning from a place we’ve been. 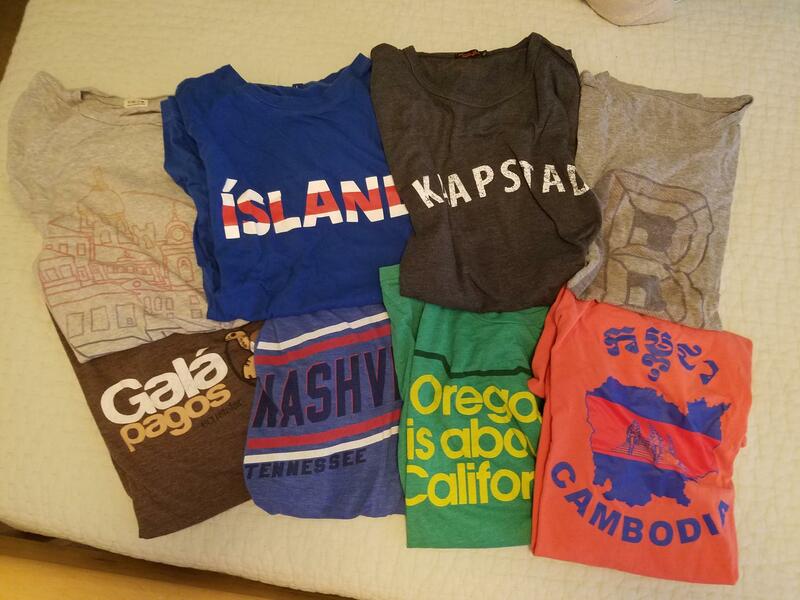 I also tend to pick up a new shirt from places we’ve been. These are the only shirts I wear any more. It’s also a lot of fun when someone strikes up a conversation about having been to the place that’s represented on my shirt. This is only a few of them. 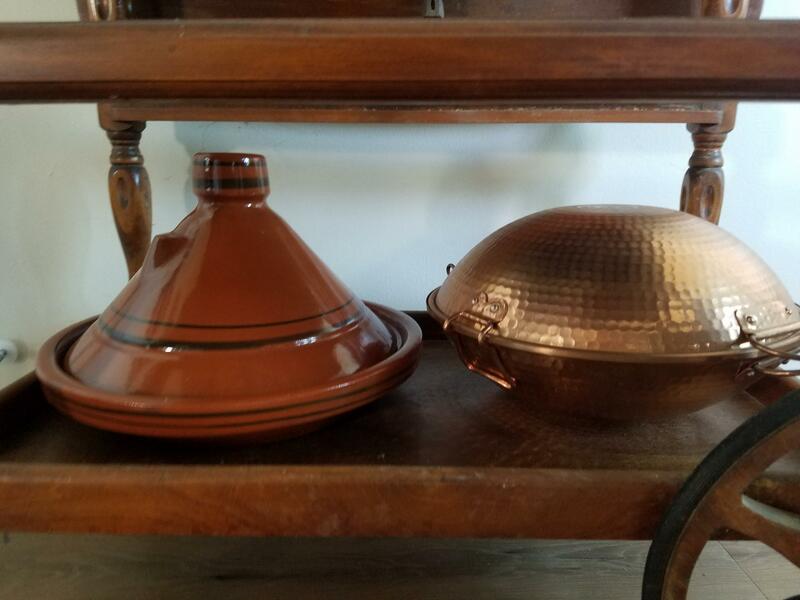 Even when we get things that are useful and decorative, we’re still eating up space and time with stuff. Our house is still filling up with these things we’ve gotten as we’ve traveled. My drawers are over flowing with shirts. Alas, we’re transitioning away from these types of souvenirs as well. But, we still want to keep some memento of our journey. 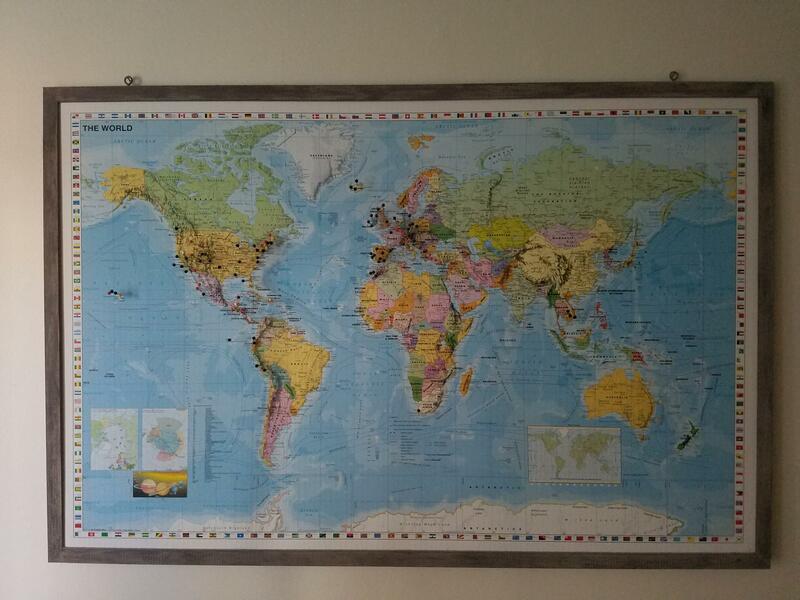 So, we’ve started a travel map with pins for places we’ve been. Yes, we have been to all these places. White – Where we got married (Yes, there’s two, we had a destination wedding, so we got married once in the Reno (legally) and once in Belize (ceremony)). We actually get quite excited to add a new pin to the map. These pins are great reminder of where we’ve been and all the adventures we’ve had, but don’t take up much space. When we downsize, this is something that we will most definitely keep with us. While in Cape Town, we were searching for a souvenir. We didn’t really know what to get (Yes, I did get a t-shirt- See the KaapStad Shirt Above). But, something quite magical happened. We were belly up to the bar at a local brewery and discussing life with the bar maid. She happened to be from Oregon, and we talked about her time living in Cape Town and how different it was compared to her life back in the States. This was our kind of spot, relaxed, low-key, and everyone was friendly. We left to try another couple breweries right down the road, but they were not nearly as interesting and fun as the first place, so we returned. Upon our return, we got to meet the bar maid’s husband (or boyfriend?) who owned and operated the brewery. He gave us a tour and showed us all the new equipment they were installing. He bragged about his brewery growing and how they were gaining nationwide attention. It really was a fun night of trying various special and limited edition brews with the brew master and meeting all the employees. As our time in Cape Town progressed, we talked about returning to that brewery. I went online to find their hours and when I found their website, low and behold… they had an African version of a crowd funding campaign, raising money for their next expansion of the brewery. We ended up back at the brewery, tasting all the beers, enjoying our time again. In fact, we actually left from there to go to the airport to fly home. But, during our last time there, I mentioned to the owner that I saw their crowd funding campaign. He mentioned that you have to have to be a South African citizen, but he’s sponsored all sorts of family and friends from around the world, and would gladly be a sponsor again. On our long flight home – 10 hours Cape Town -> Paris | 9 Hours Paris -> Detroit | 3 Hours Detroit -> LA – we discussed the opportunity. We came to the conclusion, that it would be a fun thing to be involved with. We weren’t quite sure how it would work and didn’t want to throw a ton of money at it, but we were interested. Upon returning home, I shot an email to the owner saying that I was interested in proceeding to invest in the brewery. After a couple contracts, a bunch of emails, and an international wire transfer, we’re now proud part-owners of a South African Brewery!!!! Now, we didn’t put a ton of money into it, it’s something that if we never see it again, it won’t make much of a difference. But, it was enough that it made me nervous. I’ve even loaded our ownership portion into our personal capital account, so every time we log in we see our investment and are reminded of the trip. What a cool souvenir! Not only do we get updates from them as part of their investor group, but we helped a locally owned business expand and grow. I think we need to start coming home with more of these type of souvenirs. 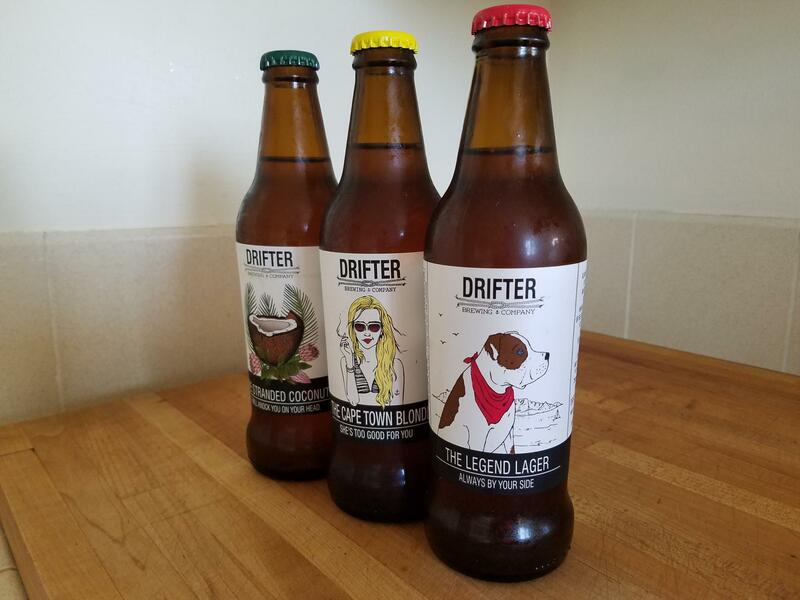 So you’re ever in Cape Town… Stop by Drifter Brewing!!! Your palate and our bank account will thank you! I also had a collection of shot glasses but they long since have been donated… moving well over a dozen times tends to force out the things you no longer love. Items that are useful, beautiful, or consumable are better trip tokens than most, to go along with your memories and photos, but part ownership in an ongoing enterprise is a cool twist. She hasn’t gotten to the point of parting yet. But it’s a hard habit to break. Yeah,don’t know that we will find a investment opportunity every place we go, I think that’s a tall order. This just kind of came out of the blue, and we thought it was pretty neat. They’re opening one in Nicaragua in Oct. So maybe we’ll head down to help open it, we are part owners after all :). I noticed that. Maybe it’s a new trend? I’m with you, haven’t bought any chotskies in years. My friends and family don’t need us dropping extra junk on them from one of our vacations. But we do still like to get useful mementos. Like you, I’m a big t-shirt collector! You’re gonna need them anyway, and now they can also be a great memento and conversation starter. The t shirt thing I need to get better at, we travel so much, I’m getting more than I need. And yes, the brewery was a nice addition to our souvenir list. Beers are good too… we came home with a bunch from Trillium! Man, the term “gift shop” makes me want to spew violently. However, I admit to buying lots of crap in the past. Hello 50 pint glasses! Hell, I’d still buy one, but it would have to be one badass pint glass. My favorite thing to do now is take a bunch of pictures and then print out/frame a good one. I love to take pictures of places as well, but we like the paintings. We usually get them from either small shops or from street vendors. Very jealous about the brewery investment. That’s so cool and what good memories! Nice story!! Fun stuff. We have some in our fridge still. I’m with you on useful or beautiful. We’ve picked up a lot of local art… think some guy painting next to the park and selling his landscapes (but some of it is more abstract – which is what I like). Our walls are pretty full now, but I’ve also stuck with small and portable items over my travel lifetime. Mostly, I pick up a charm for my charm bracelet. Like your shot glasses, I have over one hundred of these, but they all fit on one bracelet that I wear frequently. I also like to grab some local yarn for knitting projects. Fiber and dye are different all over the world, and it’s a great ice breaker with local people. Useful or beautiful definitely need to be things looking for souvenirs. Most of the art we get is just like you. Street vendors painting them on the street. They are more fun to pick up then the mass produced stuff at the airport. Plus, I’d rather give the money to that guy. Love it! We finally figured after collecting stupid chess sets from Peru and silly masks from Mexico that it’s easiest to just take photographs and let those be the souvenirs. Still, sometimes you just gotta go for that Bob Marley autographed bong cuz when will you ever get another opportunity like THAT?!? I’m sitting here staring at our Joe Montana signed Jersey that we got from when we went to SuperBowl. But we didn’t pay for it. We ran into him and he signed it for Mrs Wow. So that’s something we cherish. So there are things that we like, but the junky chotzky’s are coming to their end. Awesome story! Definitely more fun to invest in a business than bring home more stuff you don’t need to clutter up your place 🙂 I have a zero souvenir rule now. The only things we bring back are pictures and memories. Very cool to see you’ve been to pretty much all the same places we’ve been to. I love world maps. It’s my new favourite thing. Yeah, maps have a very special place in our heart… especially with the Mrs. That map is something we really enjoy, and adding a pin is something that we really look forward to after our trips. We’re getting better about taking only pictures and leaving only footprints. We’re moving toward it. But investing in a brewery was just something that I couldn’t pass up. It was such a cool opportunity, and something that we will cherish for a while. Plus we helped out a local business. Win-Win-Win!! I rarely purchased souvenir when I was young because I didn’t have much money and didn’t travel much. That habit stuck and we rarely purchase anything when we travel these days. Our kid is more spoiled, though. He usually gets one or two souvenirs per trip. It’s usually some kind of rock, for now. We didn’t invest all that much.. about 30k zar or 30 shares. Which comes out to ~$2,300. It’s enough to make you think but if it disappears we wont be too heart broken. We always did try to get some stuff, but we’re shying away from it now. Useful or beautiful, and pictures.